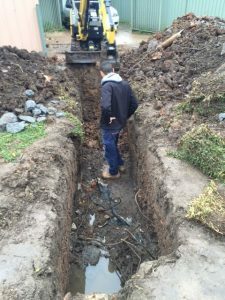 We specialise in fixing blocked sewers, storm water drains or clogged toilet. We have even been called the sewer specialists, because we are well known for clearing storm water drains and clogged sewers. From a tree and plant roots, broken pipes. Foreign objects falling down the toilet. Most of these (except maybe the broken pipes) are easily preventable with a little foresight. Handy advice to prevention. Clear away any tree or plant roots from your sewage pipes, don’t pour grease and oil down the sink, and don’t flush anything down the toilet, except toilet paper. If you need a sewer plumber fast, call us 24 hour hotline on 02 9863 3025 and Rhino will be there ASAP. From a shovel or digging through the storm water pipes. The pipes are broken from concrete or building rubble. Wrong diameter pipes were installed or installed incorrectly.